Consider the size of the average parking space. 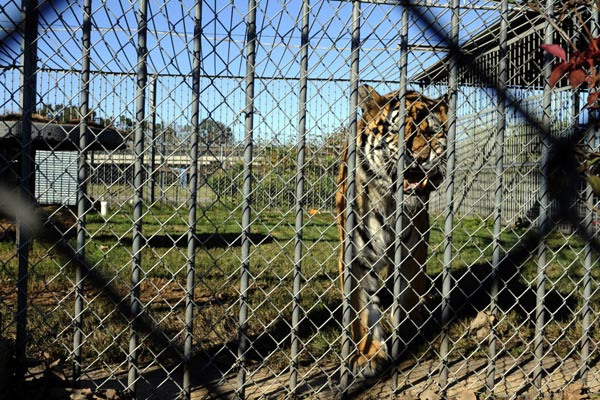 If you had a cage that size, the USDA says you can house two fully grown tigers inside. As long as the animal can stand up and turn around, he or she has all the space required by law. And because there are no laws requiring exercise or enrichment, many tigers live in a cage that size their entire lives. Granted, many captive tigers die within the first two years of life. But a tiger can live up to 25 years. Female tigers will be bred repeatedly to maintain the number of cubs needed to run the pay to pet operations. One such operation uses up to 200 cubs per year to keep their business going. Captive tigers are inbred, which means they are not genetically close to wild tigers. They could never be released into the wild because of the repeated inbreeding. By the way, do you know that ALL white tigers are the descendants of one tiger? They do not occur naturally in the wild, and are available only because of mass inbreeding. Want a pet tiger? It’ll cost ya! 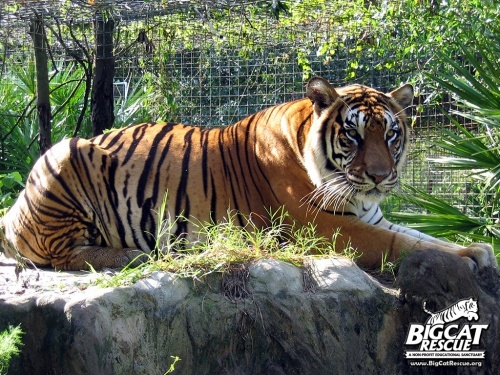 Tigers require 10-15 pounds of meat per day, as well as supplements. Veterinary care will be expensive. Oh, and the smell. Even a spayed tiger will mark its’ territory. Caring for a pet tiger will cost you around $10,000 per year. But a dead tiger could net you $50,000. Pelts can go for as much as $25,000. Various body parts are sold to make traditional medicines. Bones are used to make Tiger Bone Wine. Sometimes tigers are first hunted, then killed. Confined or “canned” hunts happen all over the world, including the US. If you have enough money, you can pay to hunt and kill a tiger. Or you can skip the hunting part and kill one in a cage. Some hunters pay up to $25,000 for the opportunity to kill a tiger. So while it’s nice to think that these animals will get a happy ending in a place like Big Cat Rescue, the reality is there are far more tigers than there are places of refuge. And most of them lead a very sad existence. Tomorrow I’m going to tell you what you can do to help stop this insanity. I would love to know how to stop this insanity. My heart breaks for all animals mistreated in any way. I have answers! And, surprisingly enough, they are fairly easy things we can all do! Come back tomorrow! I had no idea this was going on until that intern’s death spurred me to learn more. I can’t ‘like’ this story. It’s awful. Thank you for sharing it – poor Kenny, I hope he realises how beautiful he is. Can you imagine how many Kenny’s there are out there? Most are probably kept alive long enough to get a decent size pelt. And yet it’s very true. And much of it is legal. There are some excellent zoos that are working to ensure species survival. When are a part of a scientifically-managed captive breeding program. But most of these tigers you see in private zoos or backyards are not bred in this manner, so they could never be incorporated into an ethically-managed zoo. This is terrible, it’s worse than I suspected. Thank you for raising awareness of this. It is very sad Clowie, and the sad truth is that most people don’t know this kind of stuff goes on. How shocking. I had no idea about this cruelty, until I read your post. I really hope this cruelty to the beautiful big cats can be stopped once and for all. In China they have tiger farms where they breed hundreds of tigers for sole purpose of killing the animals to sell. And in Africa they are also exploited for tourism. It’s very sad. No!!! Purrime Ministerettes has not given any Purrime Ministerette purrmission for doing things like this to big cats and shall never give any Purrime Ministerette purrmission! Dear Purrime Ministerettes, I hope you will join with me to help change things for these magnificent animals. In UK, we has bootiful place for them big cats. Them tigers is sweet and likes hoomans to has fun wiz and play games wiz. Them also coming near hoomans that visit them and they purr. That may be, but tigers are wild and it is not natural to expect them to interact with humans. Sadly, humans want to own these creatures and play with them, but they do very little to allow them to live the way nature intended. I am so angry I dare not write what I feel. This is reminiscent of death camps WW2 and all prison camps past and present. Funny isn’t it? Americans are all up in arms about the Chinese for eating dogs. But stuff like this happens in their own backyard and they are allowing it to happen. Same with us this side of the pond we all get up in arms about mistreatment of animals when no doubt alsorts of dreadful things are going on in our own back yards( figuratively speaking that is ) all we can do is to keep shouting loud! We hear about this all the time and just can’t believe it still is happening! And yet it is. The illegal animal trade is a 10 BILLION dollar a year industry, second only to the illegal drug trade. Fascinating and so, so sad. Paying to kill a tiger in a cage?? That is without doubt the most grotesque thing I’ve heard for a long while. Sick, sick, sick! What big men (and women) they must think it makes them. Pah! When I was a child I remember a tiger pacing back and forth and pacing and pacing in what must have been an 8×14. Even at that young age I knew he must have been going stark raving mad. Rhat is so horribly sad Rumpy, and such evil humans. I hope Karma bites them on the buttocks. I just wish it would bite them sooner, and a bit more forcefully. No, it was greedy humans wanting a beautiful tiger that created Kenny and probably many others like him. Thanks for sharing this Rumpy – this is really sad and I didn’t know about it. This is so not cool, it breaks my heart! It is good that you publicise this. I have never heard of tiger cub petting shows, breeding mills… if this means here in Australia we are not contributing to this, that’s fine with me. The other animal welfare issues we have to deal with are more than there should be. The human species can be so stupid & greedy. I’m not a cat-lover, but I hate to see these giant felines treated so negligently. People who do this need to be smacked and then jailed. 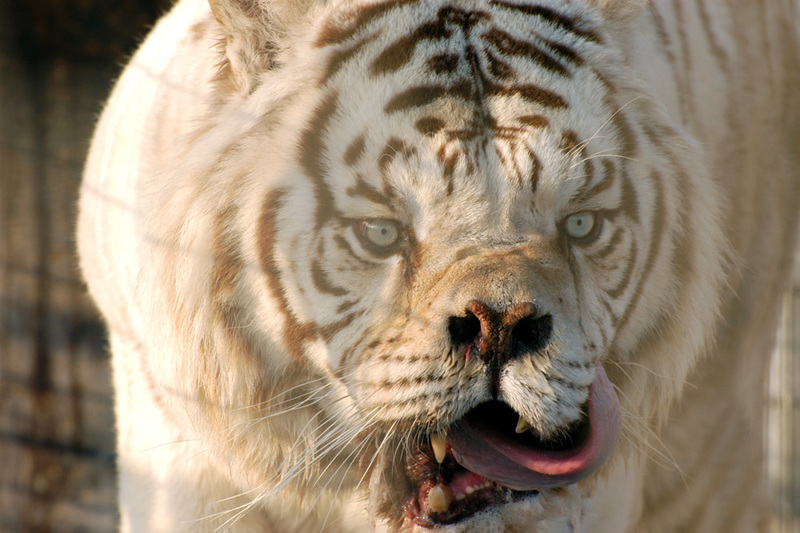 I’ve seen the deformed tiger.. all white tigers have deformities because they are unnatural. It’s heart breaking to see these animals. My children and I went to the zoo this week, and my kids loved the Tigers so much they were asking to have one as a pet. I spent a lot of time explaining to them that Tigers aren’t meant to be pets. I’m shocked that the cage requirements aren’t more than that!! When one of my students told me she wanted to own a dolphin, I told her that they need to be in the wild … that the water they are in (Killer Whales, and other huge marine life, have at places like Sea World) is very confining compared to what they would have in the wild. For a cheetah, which can run up to 70 mph, no zoo provides the kind of space the cat would find in the wild … and that’s not right. “WE bought a Zoo” with Matt Damon? You MUST watch it!!!! Gad, I would love to put the humans in the cages. What travesty. I don’t understand why zoos and other facilities have one set of requirements that meet the animal’s needs, yet there’s another set for private ownership. Even why there can be private ownership. The USDA regulates private ownership of tigers, as they do puppy mills. In fact, the problems with captive tigers sounds eerily similar to those of the puppy mill industry. Which is one reason why I am fighting this fight. One can only help the other. Tiger Tiger burning bright in the forest of the night. But they lose their glow when encarserated.